Abstract: This paper presents a multiobjective optimization of post-tensioned concrete road bridges in terms of cost, CO2 emissions, and overall safety factor. A computer tool links the optimization modulus with a set of modules for the finite-element analysis and limit states verification. This is applied for the case study of a three-span continuous post-tensioned box-girder road bridge, located in a coastal region. 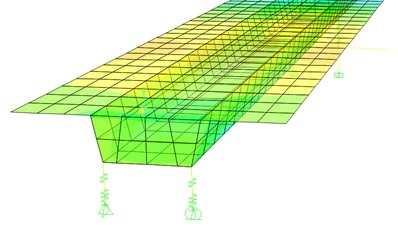 A multiobjective harmony search is used to automatically search a set of optimum structural solutions regarding the geometry, concrete strength, reinforcing and post-tensioned steel. Diversification strategies are combined with intensification strategies to improve solution quality. Results indicate that cost and CO2 emissions are close to each other for any safety range. A one-euro reduction, involves a 2.34 kg CO2 emissions reduction. Output identifies the best variables to improve safety and the critical limit states. This tool also provides bridge managers with a set of trade-off optimum solutions, which balance their preferences most closely, and meet the requirements previously defined. A multiobjective optimization of post-tensioned concrete road bridges is presented. A computer tool combines finite-element analysis and limit states verification. Output provides a trade-off between cost, CO2 emissions, and overall safety factor. Near the optima, a one-euro reduction represents a 2.34 kg CO2 emissions reduction. Results show the cheapest and most eco-friendly variables for improving safety.